What’s new in ElectricAccelerator 9.1? We recently released ElectricAccelerator 9.1, the 33rd feature release in the product’s 15-year-and-counting development history. This release includes several enhancements which I’m pleased to share with you: a new look-and-feel, improved scalability, and a new flexible licensing system to accommodate small- and medium-sized teams! Read on for more details. Agents The total number of agents in the cluster. If any are offline, a warning icon is shown next to the count. Clicking the icon will show you the bad agents. Running builds Number of builds currently in progress. CPU Hours Used The total CPU time used by all builds ever run on the cluster. For example, a build that used 10 agents for 1 hour used a total of 10 CPU-hours. Developer Hours Saved The total time saved by using Accelerator. For example, if your build takes 10 hours when run serially but just 1 hour with Accelerator, you save 9 hours each time you run that build. Days Remaining Number of days until your license expires — so you know when to renew. Welcome: a brief description of the major new features in the release you’re using, as well as information about new releases if you’re not running the latest version. Online Resources: links to sources of help like the ElectricAccelerator Knowledge Base and Ask Electric Cloud, our community Q&A site. Lightning Lessons: short tutorials and demos to help new users get started using ElectricAccelerator to crush build times. Agent Usage: this graph shows agent availability and demand over the past 24 hours, so you can quickly see if usage has exceeded capacity, indicating that you need to expand your cluster. Build Duration: here you’ll see the duration of every build run in the past 24 hours, colored according to build class, so you can easily spot aberations. Clicking any of the data points will take you to the details page for that build. Accelerator 9.1 includes Cluster Manager improvements under-the-hood as well. First off we attended to some long overdue maintenance by updating from Java 6 to Java 8. This required us to update many of the third-party libraries upon which the Cluster Manager is built, which in turn prompted a variety of source code changes to account for changes in APIs — affecting about 26% of the Java classes in our implementation. For now the primary benefit of this work is improved stability and reliability as we pulled in fixes in those third-party libraries. But in future releases, the groundwork we’ve done in 9.1 will enable us to take advantage of modern language features in Java 8, and to use new third-party Java integrations that have been introduced in the past few years. The other major back-end change for the Cluster Manager is that it now runs on top of a 64-bit JVM. This enables the CM to more easily manage the large, busy clusters that some users wish to deploy — thousands of agents with hundreds of concurrent builds, with tens of millions of builds executed over the lifetime of the deployment. Finally, Accelerator 9.1 includes some changes to the way the product is licensed based on our experience with ElectricAccelerator Huddle, the freemium/low-end version of Accelerator that’s been in public beta for a few years. For small-to-medium-sized teams, Accelerator can be licensed by number of agents and number of concurrent builds, at a price point that I think users will find very reasonable (unfortunately I can’t disclose specific numbers here). In addition, management of so-called “local agents” has been drastically simplified, again based on our experience with Huddle. To put it simply: local agents — any agent that is running on the same host as emake itself during a build — are now managed via the Cluster Manager, just like any other agent in the cluster. Both the CM and emake will prefer to allocate and use local agents when possible, as these tend to give better performance by avoiding network overhead. 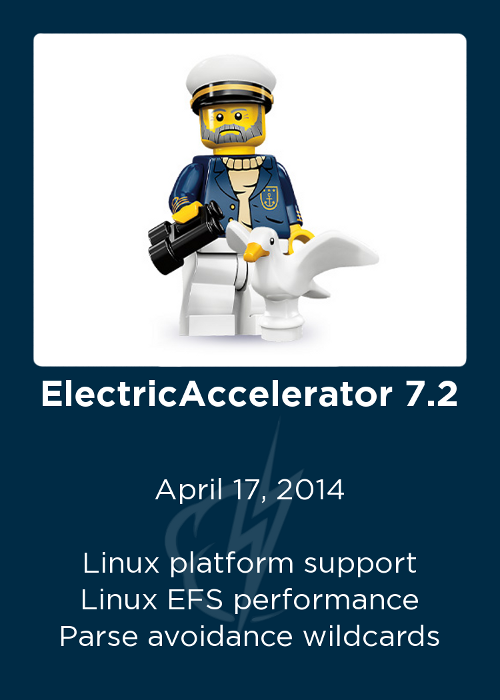 ElectricAccelerator 9.1 is available immediately for current users via the Electric Cloud ShareFile site. For new users, contact sales@electric-cloud.com for a demo or eval download. Upgrading is recommended for all users. As always, this release would not have been possible without the outstanding efforts of the ElectricAccelerator Engineering team at Electric Cloud. Thank you all for your contribution! What factors affect build performance? Recently a customer asked me to help them create a list of factors that affect build performance. They found themselves often tasked with explaining to their developers why one build had worse performance than another, or with finding ways to further improve the performance of a build. This is a very big, very complex question — I think perhaps much more so than they realized at first! In fact I think the question as posed is fundamentally unanswerable: I could never give an exhaustive list of the factors that affect build performance. There are too many, and there are surely some that I myself have yet to see — “unknown unknowns” as they say. Nevertheless, there is value in making a list, even if incomplete, if for no other reason then to serve as a reference for people trying to understand or improve the performance of their builds. What follows is my attempt at creating that list, roughly in order of importance — but bear in mind that this ordering is somewhat subjective, and highly situation-dependent: your mileage may vary, and different builds will have different specific bottlenecks. Builds can be measured in many ways: number of output targets, number of input files, total lines of code, aggregate bytes of output generated, etc. Generally speaking, the bigger the build is, the longer it will take to complete. If your build is long simply because of its size, you may think you have no opportunities, but that’s not so: parallel builds, caching outputs, componentization and beefier hardware can all help cope with this type of problem. Most build tools support some form of parallel execution — GNU make’s -j option is the classic example. Assuming there is parallelizable work in the build, the build that runs on more cores (that is, with a higher -j value) will complete more quickly. Running a build on many cores only helps if there is exploitable parallelism in the build. If the build is defined in such a way that parallelism is limited, then it will take longer to complete regardless of the -j value. For example, some builds may have unnecessary serializations in the dependency graph, which will limit performance. The use of (or failure to use) caching technology, such as ElectricAccelerator’s JobCache, ClearCase winkins, or ccache, can dramatically impact build performance. In my tests caching such as JobCache can reduce build duration by 50% or more for full builds. For builds executed with ElectricAccelerator, conflicts can have a significant impact on performance. Briefly, an Accelerator conflict is any time your build “loses” a race condition between two steps that should have been serialized but weren’t due to missing dependencies in your makefile or build files. Accelerator can detect and correct such errors on-the-fly, but it comes at a cost. A few conflicts is usually not a problem, but if you have hundreds or thousands, it will make your build slower as Accelerator reruns portions of the build to get the correct results. Usually if you see such a scenario it’s a sign that you didn’t have a complete Accelerator history file for your build, so fixing such issues is as easy as using the history file generated by that build to augment the dependency information in future runs of the build. There are many attributes of the code itself which can affect build performance. For example, as a general rule, very long source files will take longer to compile than shorter files. Files containing very long individual functions will take longer to compile than files with only short functions. Heavy use of templates in C++ will cause slower compilation. Careless use of #include statements in C or C++ code will cause slower compilation and can be especially harmful to incremental builds by triggering excessive recompilation. Some languages are easier to process and therefore faster to compile. In general, C++ is slower to compile, while languages like Java or Go are very quick to compile. Some languages require no compilation at all, so builds of code using such languages can be very very fast indeed! There are a staggering array of build tools which you might choose to drive your build: GNU make, ninja, maven, ant, scons, emake, tup and more. Some were designed for high performance on full builds, while others were designed for high performance on incremental builds, and still others were designed for ease-of-use, correctness, or other non-performance related attributes. The choice of build tool will affect the performance of your build, especially if your build is very large. For compiled languages like C and C++ there are often many different compilers that you could choose from for your build: gcc/g++, clang, icc, WindRiver, Microsoft cl, tcc, etc. These tools themselves have different performance profiles, and the performance may even vary from one version of the compiler to the next. For a given compiler, the build options you enable may significantly affect the compile time. For example, when using gcc, building with -O3 is generally slower than building with -O0. Therefore for developer builds, you may consider to disable optimizations in order to reduce build cycle time. Other options that may influence compile speed include: pre-compiled headers (PCH); dependency generation (-MD, -MMD, -MF, etc); profiling or coverage analysis (-fprofile-arcs or -ftest-coverage); and include path definitions (-I), which if very long can cause the compiler to spend excessive time searching for header files. As with the compiler, different linkers have different performance characteristics. For C/C++ compilation on Linux the default linker is GNU ld, but there are alternatives like Google gold which have much better performance, albeit for a subset of the use cases supported by GNU ld. If your use case is supported by gold, you will likely see much better build performance by switching. As with any process involving computers, the amount of available memory will have a significant impact on build performance. Too little and your system will swap excessively. Fortunately there’s no such thing as “too much”, though it may be prohibitively expensive to get so much RAM that you can stop worrying about it. In practice most builds do not require a huge amount of memory, but if yours do, and you don’t have enough, your build speed will suffer. Like memory, the performance of your disk can significantly affect build performance. In fact its easier in some ways to understand the impact of disk speed. If the build generates 10GB of output and your disk can only write at 10MB/s, the fastest that the build can possibly finish is about 1,000 seconds, or nearly 20 minutes. On the other hand, if the build generates only 5MB of output and uses the same disk, then only 1/2 second is needed to write the build outputs, so the disk is unlikely to be a bottleneck. You may find that the disk is adequate for your builds now, but as the build gets bigger you will reach a point where the disk is no longer fast enough. At that point you can upgrade to a faster disk, and that will be sufficient for some time until again your build grows to exceed the capacity of the disk. Even if your disk is not a primary bottleneck now, switching to a faster disk may improve performance somewhat. Many users have had good results from switching to SSD for temporary storage, or using striped RAID for those builds that generate truly enormous amounts of data. For distributed builds such as those executed with ElectricAccelerator, network performance is crucial because build data has to be transferred across the network. But even if the build itself is not distributed, it may make use of tools pulled from a network file share, so the network performance can affect the build. Some operating systems have better performance for builds than others — in general, I’ve found builds on Linux to be relatively faster than builds on Windows, for example. Likewise, some versions of the operating system may be faster than others. Some users have reported as much as a 3x improvement by upgrading from an old version of Linux to a newer version due to optimizations in the kernel itself. Use of anti-virus software can dramatically impact build performance, particularly if the A/V is configured in one of the more aggressive or intrusive modes of operation: sometimes every file operation is intercepted by the A/V scanner, adding a substantial drag on build speed. Some build tools, such as certain commercial compilers, require licenses in order to operate. If the license system is misconfigured it can add delays to the build process, sometimes causing each compile to take minutes instead of seconds as the compiler tries and fails to contact a license server, or contacts the wrong license server instance (for example, one on a different subnet). So there you have it: my (not entirely) comprehensive list of factors that can affect build performance. Of course these won’t all be relevant for every build: every build is different, and each has a unique performance profile. A slow disk may be mostly irrelevant for one build but absolutely critical for another. My hope is that this list will serve as a foundation for your build performance investigations — something to help get you started, even if it doesn’t get you all the way to a conclusion. What do you think of my list? What would you add, and how would you change the ordering? Let me know in the comments below. What’s new in ElectricAccelerator 9.0? Just a couple months ago, in October 2016, we released ElectricAccelerator 9.0. This version includes some really exciting new functionality and unlocks even more amazing performance than ever before. For the first time since 2008 we added support for a new build tool: ninja, an ultra-fast new make-like build tool and the workhorse at the center of the build for both chromium and Android (yes, that Android). And we’ve continued to expand the JobCache feature — a generalization of the parse avoidance feature introduced in Accelerator 7.0. With Accelerator 9.0 you can cache more types of work, including GCC/G++ compiles, clang compiles, Microsoft cl compiles, javac and javadoc, and Google’s new Jack compiler for Java code. Even better, you can share cached results with other developers to amplify the gains across an entire team. Read on for details. Accelerator 9.0 introduces support for the ninja-based builds. Ninja is a very interesting build tool: conceptually similar to make, but radically simplified (at least so far!). Gone are things like built-in functions, pattern rules, vpath, conditional directives, and all the other things that make it hard to parse and evaluate makefiles quickly. This enables the ninja parser to evaluate “ninja files” unbelievably quickly, but at the cost of making ninja files verbose and ill-suited for creation by hand. Instead, ninja files are typically generated from some other process, such as CMake. The benefit to the end user then is extremely fast incremental builds: for example, in Android 6.0, using the original make-based build system, a no-touch build could take as much as a minute to run even though there’s no work to be done. In Android 7.0, using the new ninja-based build system, the same build can be completed in about 5 seconds! command = echo "Hello, world!" As I said, it’s utterly uninteresting, which, quixotically, makes it very interesting: the integration is seamless and it “just works”. 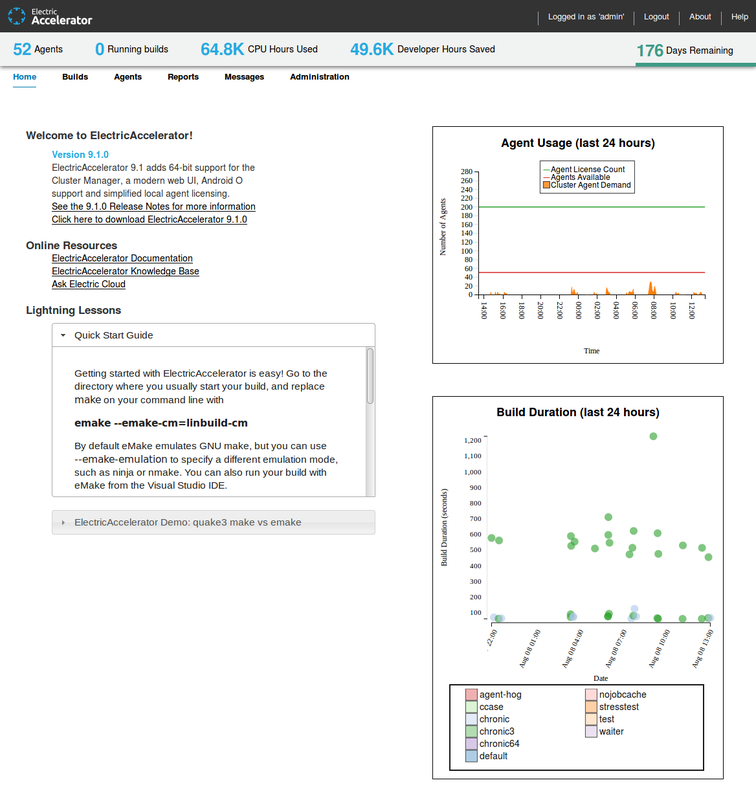 Even better, by running your ninja build with ElectricAccelerator you automatically and instantly take advantage of all the advanced acceleration and correctness features you’ve come to love about Accelerator: conflict detection, history, schedule optimization, annotation, even jobcache. It all just works. In Accelerator 9.0 we’ve expanded the reach of jobcache in two ways. First, we added support for caching javac and Jack compiles. Next, we added shared jobcache, which enables a team of developers to leverage jobcache collectively and reliably, eliminating redundant work across the entire team. Check the shared jobcache for a matching entry. If a match is found in the shared jobcache, use it. Done! If a match is not found in the shared jobcache, continue. Check the private jobcache for a matching entry. If a match is found in the private jobcache, use it. Done! If a match is not found in the private jobcache, continue. Note that the shared cache is never written to by the developers’ builds: updates are only saved in the private cache. In this way we can ensure that developers’ builds to not litter the shared cache with one-off or user-specific cache entries. Typically we expect that developers will see very good cache hit rates against the shared cache, perhaps 95% or better, since each developer modifies only a small fraction of the total source code at once. Thus shared jobcache multiples the savings from jobcache by the size of the team. The final feature of interest in Accelerator 9.0 is dynamic file patching. This is a mechanism by which emake can patch files on the fly as they are referenced during the build, based on the name, size and MD5 checksum of the original. This feature enables users to tweak build scripts or makefiles in order to improve performance or compatibility with Accelerator — critical in environments where there is limited ability to modify the original files directly. Accelerator 9.0 contains some really tremendous new features: the first new build tool emulation in almost a decade; shared jobcache; on-the-fly patching for those challenging environments where no other option will do. But as always, my eye is already on the next horizon: Accelerator 9.1. We have some big plans relating to performance and ease-of-use. It will require a lot of hard work but I think we have the right team to do it. Stay tuned. Accelerator 9.0 is available immediately for existing customers — support@electric-cloud.com to get the bits. New users can download ElectricAccelerator Huddle to take it for a test drive, or contact sales@electric-cloud.com for an evaluation of the enterprise edition. What’s new in GNU make 4.2? In May 2016 the GNU make team released GNU make 4.2. I’m pleased to see another release, though I find myself underwhelmed by both the timeline and the content of this release. When 4.1 came out just one year after 4.0 I hoped it was a sign that the GNU make project was switching to a more frequent and regular release cycle, as many software projects have done in the last several years. Although it can be a difficult adjustment this release cadence can have significant benefits like improving user engagement and reducing risk. But with the 4.2 release arriving nineteen long months after 4.1 it seems that GNU make has failed to make the transition. gradle, the default build tool for Android apps. Monthly releases. Reports and notifications. bazel, the open-source version of Google’s internal build system. Ten releases already in 2016. Checksum-based up-to-date checks and minimization of test suite executions. ninja, a make-like build tool. Two releases in the last twelve months. Resource pools and unbelievably fast parsing / low overhead. So, what does GNU make 4.2 have to offer? Read on to see, and let me know in the comments if you disagree with my analysis. As you can see, it’s now possible to make your makefile react in whatever manner you deem appropriate when a shell invocation fails. Be advised, however: if you find yourself doing this, it may be an indication that your makefile is poorly written — almost every use of $(shell) is better handled by creating an actual rule to do whatever you were going to do with $(shell). The $(file) function was added to GNU make in the 4.0 release, in order to enable the creation of files directly from make — quite handy for those cases in which the content you want to write is so long it exceeds command-line length limits on your system. In 4.2 the $(file) function was extended so that you can use it to read files in addition to writing files. For example, SRCS := $(file <sourcelist.txt) would capture the content of the file sourcelist.txt in the variable SRCS, less the final newline in the file, if any (that last bit is for consistency with the $(shell) function). GNU make 4.2 includes a small but very useful improvement in error reporting: previously when make encountered an error while executing a recipe, it would report only the name of the target being built, such as make: *** [all] Error 1. Starting with 4.2, this error message includes the makefile and line number of the specific command that produced the error: make: *** [Makefile:6: all] Error 1. This should make it much easier to debug large, complex builds — especially anything that uses double-colon rules to composite functionality from many fragments in distinct makefiles. In addition to the modest enhancements described above, the 4.2 release includes about three dozen other bug fixes. A glance at the resolution dates on those reveals that sometimes months passed with no updates. This makes me wonder why they didn’t cut a release at those points, even if it were just for bug fixes. My guess is that the project is trapped, in a sense: because the interval between releases is so long there’s a sense that each release has to be “perfect”, and because there’s an attempt to ensure each release is “perfect”, the interval between releases must be very long. Contrast this with a more agile approach, which can tolerate imperfect releases because the next release is just around the corner anyway. Combined with an ever expanding automated regression test suite it’s possible to gradually increase the bar for release quality, such that in fact the likelihood of a bad release goes down when compared with a project that has a long release cycle and is dependent on mostly manual testing. GNU make isn’t going to go away any time soon, but I think the writing is on the wall: if it doesn’t start innovating again, developers will inevitably migrate to other build tools that do. What’s new in GNU make 4.1? October 2014 saw the release of GNU make 4.1. Although this release doesn’t have any really remarkable new features, the release is notable because it comes just one year after the 4.0 release — that’s the least time between releases in more than a decade. Hopefully, this is the start of a new era of more frequent, smaller releases for this venerable project which is one of the oldest still active projects in the GNU suite. Read on for notes about the new features in GNU make 4.1. Starting with 4.1, GNU make defines two additional variables: MAKE_TERMOUT and MAKE_TERMERR. These are set to non-empty values if make believes stdout/stderr is attached to a terminal (rather than a file). This enables users to solve a problem introduced by the output synchronization feature that was added in GNU make 4.0: when output synchronization is enabled, all child processes in fact write to a temporary file, even though in effect they are writing to the console. In other words, the implementation details of output synchronization may interfere with behaviors in child processes like output colorization which require a terminal for correct operation. If MAKE_TERMOUT or MAKE_TERMERR is set, then the user may explicitly direct such commands to maintain colorized output despite the fact that they appear to be writing to a file. The $(file) function was added in GNU make 4.0 to enable writing to files from a makefile without having to invoke a second process to do so. For example, where previously you had to do something like $(shell echo hello > myfile), now you can instead use $(file > myfile,foo). In theory this is more efficient, since it avoids creating another process, and it enables the user to easily write large blocks of text which would exceed command-line length limitations on some platforms. In GNU make 4.1, the $(file) function has been enhanced such that the text to be written may be omitted from the function call. This allows $(file) to work as a sort of “poor man’s” replacement for touch, although having reviewed the bug report that resulted in this change, I think this is more an “enhancement of convenience” than a deliberate attempt to evolve the program. Of course I have to give a shout out to my friend Tim Murphy, who filed the bug report that led to this enhancement — nice work, Tim! This is an interesting change mostly for the high level of drama surrounding it. That bit of syntax is clearly illegal — in fact, if the pattern target is listed first rather than the explicit, GNU make has long identified this as invalid syntax, terminating the parse with *** mixed implicit and normal rules. Stop. Unfortunately, due to a defect in older versions of GNU make this construct is not prohibited when the explicit rule is named first. In 3.82, the GNU make maintainers fixed the defect: whether or not the explicit target is named first, GNU make would identify the invalid syntax and terminate parsing. Everything was fine for about a year, and then? People flipped out. As it turns out, this construct is used by a prominant open source project: the Linux kernel. The offending syntax had been eliminated from the main development branch shortly after the 3.82 release, but third-party developers suddenly found themselves unable to build legacy versions of the kernel with the latest release of GNU make. A bug report was filed and generated 21 reponses, when the average GNU make bug report has only 3. Ultimately, the maintainers relented by reducing the severity to a non-fatal error for the 4.1 release — but with a stern message that this will likely become a fatal error again in a future release. In addition to the bigger items identified above, the 4.1 release includes about two dozen other bug fixes. Overall, this release feels like a minor one — as often happens when release frequency increases, the individual releases become less interesting. From an agile/continuous delivery standpoint, that’s exactly what you want. But I’ve found that it is also difficult for a team that’s accustomed to less frequent releases with larger payloads to transition to smaller, more frequent releases while still incorporating large changes that take longer than one release to implement. Of course, one point does not make a line — that is, we can’t tell from this release alone whether the intention is to switch to a more frequent release cadence, or whether this release is an exception. If they are trying to increase the frequency, I think it will be very interesting to see how the GNU make development team adapts to the new cadence. Regardless, I’d like to congratulate the team for this release and I look forward to seeing what comes next. One thing that many GNU make users struggle with is predicting the value of a variable. And it’s no wonder, with the way make syntax freely mingles text intended for two very distinct phases of execution, and with two “flavors” of variables with very different semantics — except, that is, when the one seems to behave like the other. In this article I’ll run you through the fundamentals of GNU make variables so you can impress your friends (well, your nerdy friends, anyway) with your ability to predict the value of a GNU make variable at social gatherings. MYVAR = abc creates the variable MYVAR if it does not exist, or changes its value if it does. Either way, after this statement is processed, the value of MYVAR will be abc. MYVAR ?= def will create the variable MYVAR with the value def only if MYVAR does not already exist. MYVAR += ghi will create the variable MYVAR with the value if MYVAR does not already exist, or it will append ghi to MYVAR if it does already exist. MYVAR := jkl creates MYVAR if it does not exist, or changes its value if it does. This variation is just like the first, except that it creates a so-called simple variable, instead of a recursive variable — more on that in a minute. In addition to the various assignment operators, you can create and modify variables using the define directive — handy if you want to create a variable with a multi-line value. Besides that, the define directive is equivalent to the normal VAR=VALUE assignment. Environment variables are automatically created as GNU make variables when GNU is invoked. Command-line definitions enable you to create variables at the time you invoke GNU make, like this: gmake MYVAR=123. Built-in variables are automatically created when GNU make starts. For example, GNU make defines a variable named CC which contains the name of the default C compiler (cc) and another named CXX which contains the name of the default C++ compiler (g++). Now that you know how to create a GNU make variable and how to dereference one, consider what happens when you reference a variable while creating a second variable. Let’s use a few simple exercises to set the stage. For each, the answer is hidden on the line following the makefile. You can reveal the answer by highlighting the hidden text in your browser. Q1: What will this makefile print? Q2: What will this makefile print? Q3: What will this makefile print? With simple variables, subordinate variables are expanded immediately when the assignment is processed. References to subordinate variables are replaced with the value of the subordinate variable at the moment of the assignment. Simple variables are created when you use := in the assignment. With recursive variables, expansion of subordinate variables is deferred until the variable named on the left-hand side of the assignment is itself referenced. That leads to some funny behaviors, because the value of the subordinate variables at the time of the assignment is irrelevant — in fact, the subordinate variables may not even exist at that point! What matters is the value of the subordinate variables when the LHS variable is expanded. Recursive variables are the default flavor, and they’re created when you use simply = in the assignment. Now the examples above should make sense. In Question 2, we created MYVAR as a recursive variable, which means the value of ABC at the time MYVAR is created doesn’t matter. By the time GNU make needs to expand MYVAR, the value of ABC has changed, so that’s what we see in the output. In Question 3, we created MYVAR as a simple variable, so the value of ABC was captured immediately. Even though the value of ABC changes later, that change doesn’t affect the value of MYVAR. Most variables in GNU make are global: that is, they are shared across all targets in the makefile and expanded the same way for all targets, subject to the rules outlined above. But GNU make also supports target-specific variables: variables given distinct values that are only used when expanding the recipe for a specific target (or its prerequisites). At first glance you might expect this makefile to print “Goodbye!” twice — after all, ABC is redefined with the value “Goodbye!” before the commands for foo are expanded. But because the redefinition is target-specific, it only applies to bar. Thus, this makefile will print one “Hello!” and one “Goodbye!”. You can do some neat tricks with this, but I urge you not to rely on the behavior, because it doesn’t always work the way you might think. In particular, if a target is listed as a prereq for multiple other targets, each of which have a different target-specific value for some variable, the actual value used for the prereq may vary depending on which files were out-of-date and the execution order of the targets. As a quick example, compare the output of the previous makefile when invoked with gmake foo and when invoked with gmake bar. In the latter case, the target-specific value from foo is never applied, because foo itself was not processed. With GNU make 3.82 or later, you can prevent this inheritence by using the private modifier, as in foo: private ABC = Surprise!. Finally, note that target-specific variables may be applied to patterns. For example, a line reading %.o: ABC=123 creates a target-specific variable for all targets matching the pattern %.o. If you’ve made it this far, you now know just about everything there is to know about GNU make variables. Congratulations! I hope this information will serve you well. Questions or comments? Use the form below or hit me up on Twitter @emelski. Naturally with the release of ElectricAccelerator 7.2 a few weeks ago it’s time for another Accelerator “Ship It!” award. In keeping with our tradition, I gave each team member a LEGO figure that symbolized the release to me in some way, along with a a custom trading card giving the vital details: version, release date, and key features. Like a baseball card, the back is filled with a team roster and release statistics. There are some great improvements in Accelerator 7.2 but there’s no particular unifying theme, so it was quite a challenge to choose a suitable minifig. One thing that stood out is that between the time management asked engineering to create a 7.2 release and the time that development was complete was only about three weeks. At the time we were actually in the midst of development on another release entirely, with a different set of new features. The 7.2 release was very much a, “Hey couldn’t you also cut a release right now while you’re at it?” And we did. 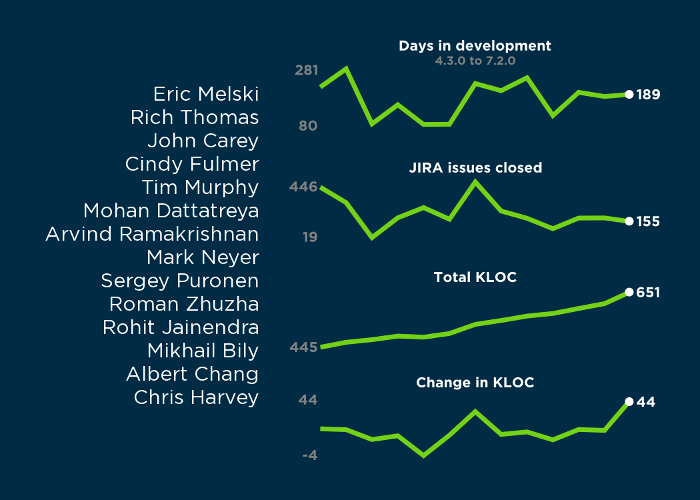 Maybe it’s not as impressive as those guys that can cut a release every minute of every day, but for a team that usually does releases on a six-month cadence, a 3-week turnaround sounds like continuous delivery to me. Number of days in development. This is just the number of days since the previous feature release — it is assumed that whatever features are in the new release, we started working on them more-or-less after the last release went out. Total KLOC. This metric gives the total size of the Accelerator code base in thousands of lines of code, as measured with the excellent Count Lines of Code utility by Al Danial. This measurement excludes comments and whitespace. Change in KLOC. This is simply the arithmetic difference between the total KLOC for each release and its predecessor. As always, my sincere gratitude goes to everybody on the Accelerator team, without whom this release would not have been. Thank you!